You've found the “U.S. 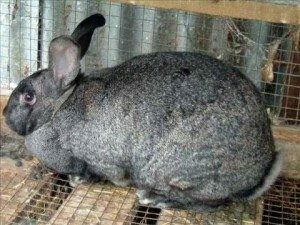 Giant Chinchilla Rabbit Breeders” page here at Hobby Farm Wisdom! If this is the first time you have visited our site: Welcome! Giant Chinchillas are large with mature bucks weighing in at 12 to 15 pounds and does at 13 to 16 pounds. This breed is a result of crosses between Chinchilla and Flemish Giant breeds and has its origins in the United States. This breed is used primarily as a commercial meat rabbit. They have a very soft, silky coat of dense, medium length hair with agouti coloring. The under color is dark slate blue, the middle color band is pearl and the tips of the hair grey. Black 'ticking' (guard hairs) are distributed over most of the body. The belly, neck, flanks and eye-circles have pale, pearl ticking and the ears are laced with black. Giant Chinchilla rabbits are generally docile, good natured and gentle.